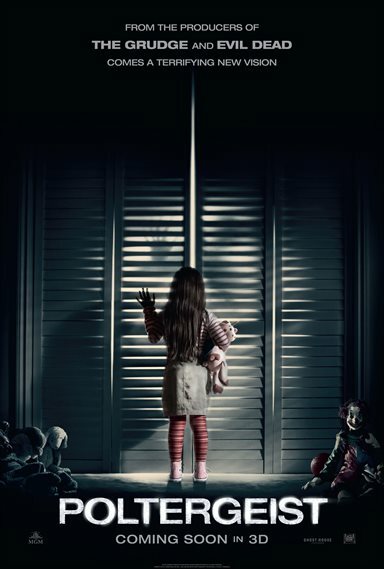 Download Poltergeist in Digital HD from the iTunes store. Poltergeist images are © Paramount Pictures. All Rights Reserved. It is the golden age of remakes in Hollywood these days, and next up in the remake playbook is the recreation of the 1982 smash horror hit Poltergeist from producer Sam Raimi (Evil Dead, Spider-man) and director Gil Kenan (City of Ember, Monster House). While not a direct word-for-word remake of the original film, Poltergeist follows the Bowen family as they move into a new home after Eric Bowen (Sam Rockwell; Iron Man, Cowboys & Aliens) loses employment. Just days after moving into their new home, the youngest Bowen children start to experience "other worldly" occurrences happening around them. While most of these occurrences spook family members, the youngest child Madison (Kennedi Clements, Rogue) sees them as playful. Once the hi-jinks turn malicious, and little Madison is taken to the other side, the Bowens must rely on the special expertise of ghost hunters, Dr. Brooke Powell(Jane Adams , Hung, Fraiser) and Carrigan Burke (Jared Harris, Sherlock Holmes: A Game of Shadows, The Man from U.N.C.L.E. ), to help them get their daughter back. With the name Sam Raimi attached to the production, one would think that the remake of Poltergeist would take the road less traveled and be a worthy update on the original. However, it fell completely flat of this moniker. While it's not a horrible film, it's just simply a boring one. The directing is decent, and the actors are extremely likable and do a convincing job on screen, but that is about all. While the original provided terror and scares that made you second guessing if your home was built on cemetery, this film just makes you not care. For fans of the original, you already know the outcome of the film and have seen it executed better, while new viewers of the story will not be scared, as the story isn't as engaging as such recent ghost horror films as Insidious and Paranormal Activity. One huge eyesore in the film is the use of computerized special effects versus the practical ones used in the original. Scenes such as the bones uprooted from the earth in the remake look cartoonish versus how they inspired terror in the original, as well as many of the hauntings and terrors used to scare the family. The extended edition of the film does fill out some scenes with adding more character development, as well as things that go "bump in the night". The alternative ending does provide a more satisfying ending than the one shown in the theatrical release. While no explanation was given on the Blu-ray, it is almost as if test audiences were not happy with such a down beat ending and this caused the filmmakers to take a lighter tone with the ending of the film. One of the main highlights of the Poltergeist Blu-ray is the presentation of content itself. Presented in AVC 1080p codec the picture quality is simply otherworldly. The picture is sharp and clear with zero artifacting or haloing. The colors perfectly match the theatrical release with an overall blue hue that overlays most of the nighttime scenes. This clarity does unfortunately cheapen some of the digital effects in the film, and, as I stated earlier, makes them appear a bit cartoonish. The DTS-HD Master Audio 7.1 is flawless. The dialog dominates the center channel while the front and surround speakers let you hear all the eerie sound effects to perfection with a full dynamic range. 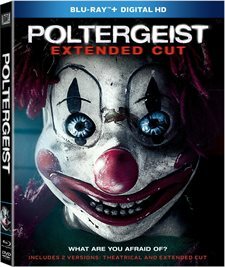 As amazing as the audio and video presentation is of Poltergeist, the extra features are the polar opposite. Aside from presenting the alternate ending to the film, the Blu-ray features a still gallery, theatrical trailers, and sneak peaks into other 20th Century Fox/MGM films. Not even a quick five minute fluff piece of the making of the film can be found on this set, which is disappointing.